Yikes. We live on a corner lot and have a really, really big front lawn. 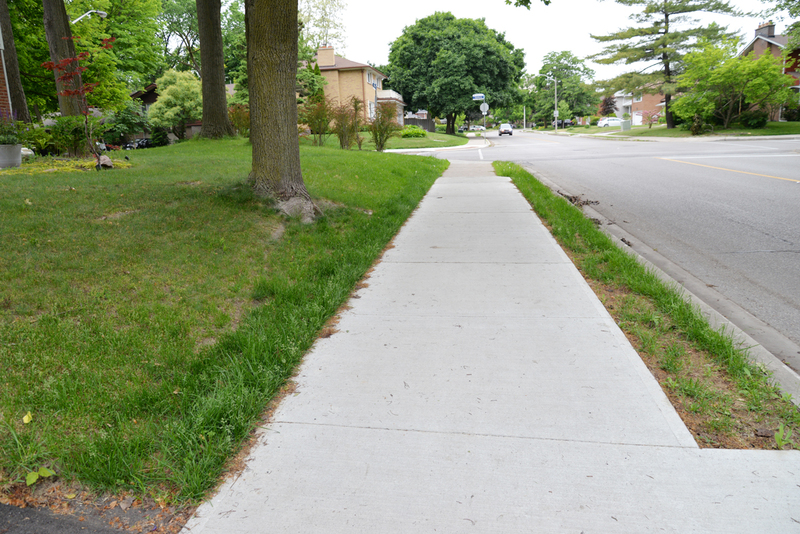 The city did some sidewalk work last summer and laid sod closest to the sidewalk. You can see how that new grass is greener and more lush... further emphasizing how dry and patchy the rest of the lawn is ;). 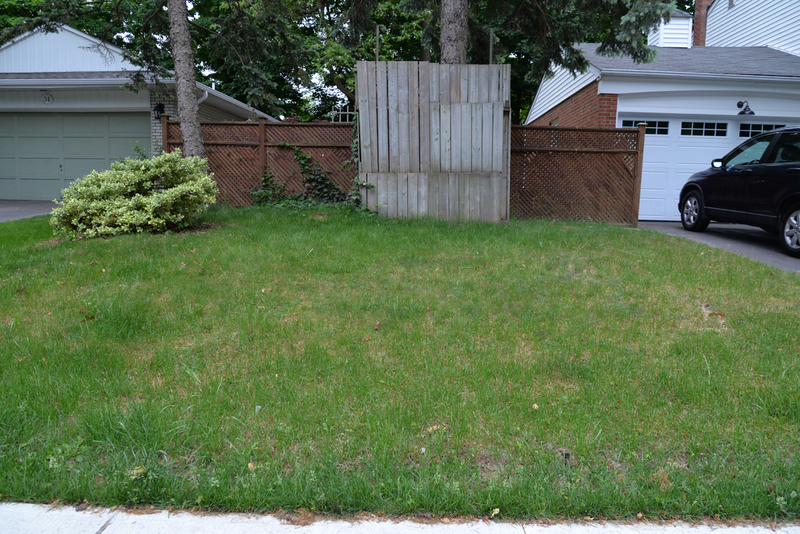 The lawn extends across the front and along one side of our house. Obviously, some weeding needs to happen! We also have English ivy growing on the lawn near the brick of our house. Yet another yard nuisance we'll either have to control or remove entirely. That wooden structure around the tree? It was a tree house, poorly built about 20 years ago, that we've been using as a storage shed for our garbage and recycling bins. It's haphazard look really adds to the appeal of our front yard, lol! I fully admit we are lacking in knowledge when it comes to caring for our lawn. 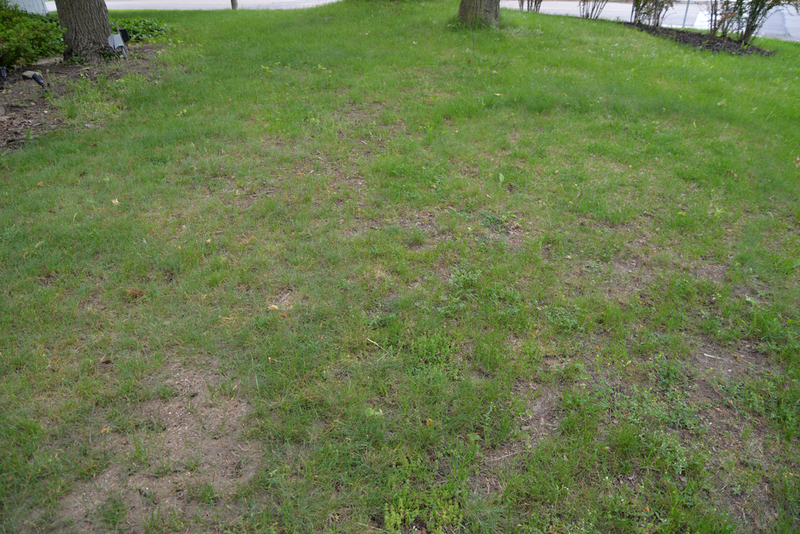 The lawn seems to have been neglected for a number of years before we moved in a year ago and the lawn is about four times the size of our previous lawn so it is overwhelming. It also has other issues: our house sits on a hill so water tends to run off and down the slope, and we have six very large trees on our front lawn, that compete with the grass for nutrients, water, and light. 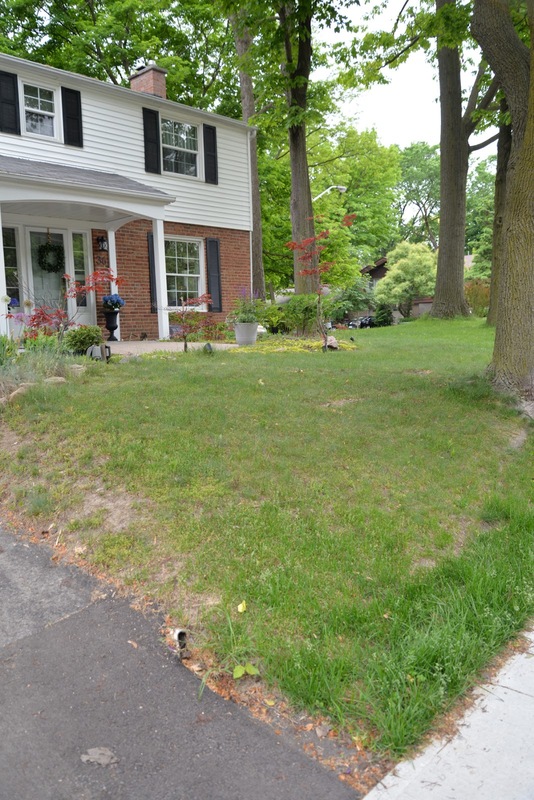 In truth, we've contributed as well to the lawn's sorry state. We could been quicker to pick up fallen leaves in the spring. We could have aerated our lawn to get a good start for the season. Cottage weekends also mean that the yard work around the house is getting neglected. I know we can't achieve it on our own so we've called in the professionals for help. 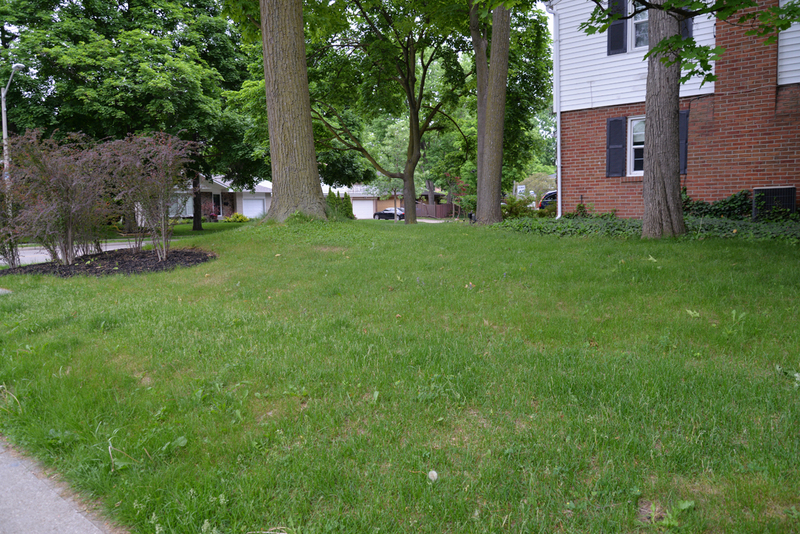 We decided it was time to get a quote from TruGreen and see if they could help us save our lawn. TruGreen is a provider of lawn care, tree and shrub care services. They offer services like fertilization and weed control, surface insect recovery treatments, aeration and overseeding. All natural services and organic services are also available. I've heard good things from friends and other bloggers who've used their services and had their lawns spring back to life so was excited to give them a try. 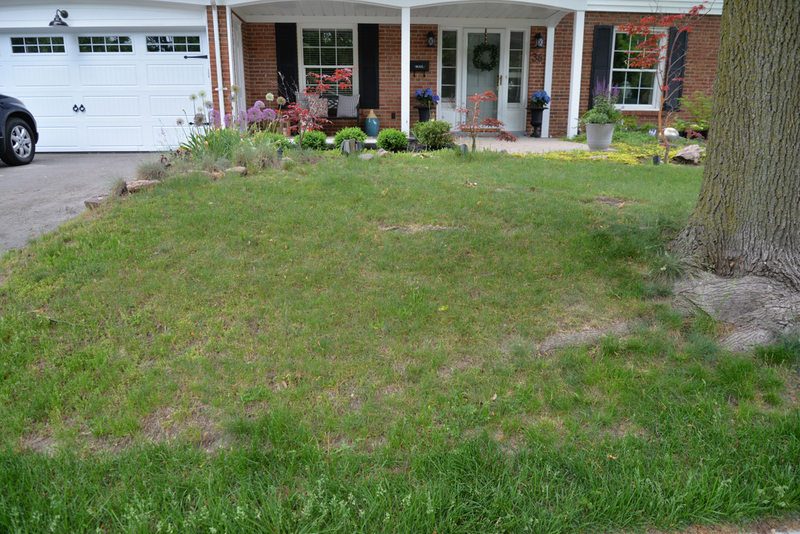 We opted for the TruMaintenanceSM plan which includes fertilization and weed control applications suited to our lawn's condition over five scheduled visits. I'm hoping these treatments will get our lawn back to a manageable state where all we're worrying about is watering it and mowing it. We've just had the first visit and I'll be sharing the results of the lawn care plan in another post at the end of the summer. I'm hoping in a few months time I'll have fewer bare patches and more vibrant grass to show you! Goodbye, old tree house. Now what are going to do about that fence?? It's looking just as bad! Do you have any lawn care tips to share? 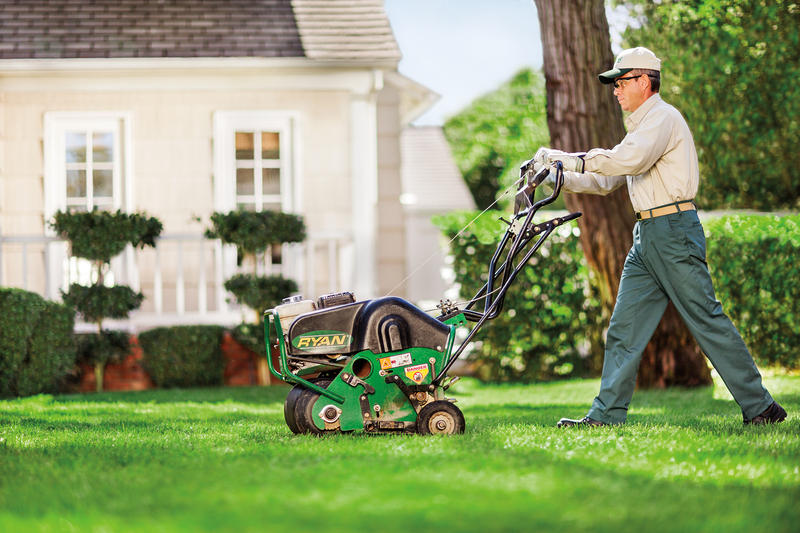 Have you used a professional lawn care service?